Liposuction, also known as lipoplasty or suction-assisted lipectomy, is cosmetic surgery performed to remove unwanted deposits of fat from under the skin. The surgeon sculpts and re-contours a person's body by removing excess fat deposits that have been resistant to reduction by diet or exercise . The fat is permanently removed from under the skin with a suction device. Liposuction is intended to reduce and smooth the contours of the body and improve a person's appearance. Its goal is cosmetic improvement. It is the most commonly performed cosmetic procedure in the United States. Liposuction does not remove large quantities of fat and is not intended as a weight reduction technique. The average amount of fat removed is about a quart (liter). Although liposuction is not intended to remove cellulite (lumpy fat), some doctors believe that it improves the appearance of areas that contain cellulite, including thighs, hips, buttocks, abdomen, and chin. A new technique called liposhaving shows more promise at reducing cellulite. Liposuction is the most commonly performed cosmetic procedure in the United States. In 2002, there were 372,831 liposuction procedures performed in the United States, approximately 13% of all plastic surgical procedures. The cost of liposuction can vary depending upon the standardized fees in the region of the country where it is performed, the extent of the area being treated, and the person performing the procedure. Generally, small areas such as the chin or knees can be done for as little as $500, while more extensive treatment such as when hips, thighs, and abdomen are done simultaneously can cost as much as $10,000. These procedures are cosmetic and are not covered by most insurance policies. swelling begins to go down after a week. It may take three to six months for the final contour to be reached. The loss of fat cells is permanent. The person should have smoother, more pleasing body contours without excessive bulges. However, if a person overeats, the remaining fat cells will grow in size. Although lost weight may be regained, the body should retain the new proportions and the suctioned area should remain proportionally smaller. Tiny scars about 0.25–0.5 in (6–12 mm) long at the site of incision are normal. The doctor usually makes the incisions in concealed places such as along skin folds, where the scars are not likely to show. In some instances, the skin may appear rippled, wavy, or baggy after surgery. Pigmentation spots may develop. The re-contoured area may be uneven. This unevenness is common, occurring in 5–20% of the cases, and can be corrected with a second liposuction procedure that is less extensive than the first. The morbidity rate from liposuction is under 1%. Mortality is exceedingly rare. Some of the alternatives to liposuction include modifying diet to lose excess body fat, exercise, accepting one's body and appearance as it is, or using clothing or makeup to downplay or emphasize body or facial features. See also Breast reduction ; Face lift ; Plastic, cosmetic, and reconstructive surgery . Engler, Alan M. BodySculpture: Plastic Surgery of the Body for Men and Women, 2nd Edition. New York: Hudson Publishing, 2000. Irwin, Brandith, and Mark McPherson. Your Best Face: Looking Your Best without Plastic Surgery. Carlsbad, CA: Hay House, Inc., 2002. 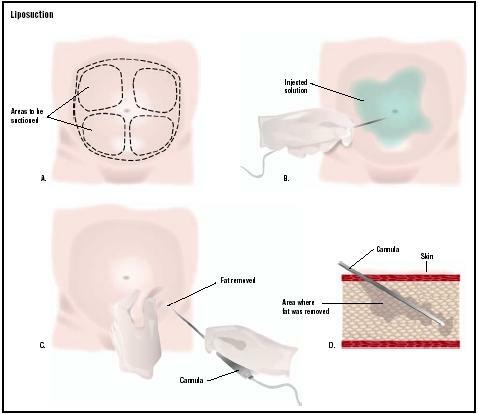 Klein, Jeffrey A. Tumescent Technique: Tumescent Anesthesia and Microcannular Liposuction. St. Louis: Mosby-Year Book, 2000. Sandhu, Baldev S. Doctor, Is Liposuction Right for Me? New York: Universe Publishers, 2001. Field, L. M. "Tumescent Axillary Liposuction and Curretage with Axillary Scarring: Not an Important Sequela." Dermatologic Surgery 29, no.3 (2003): 317–319. Goyen, M. R. "Lifestyle Outcomes of Tumescent Liposuction Surgery." Dermatologic Surgery 28, no.6 (2002): 459–462. Housman, T. S., et al. "The Safety of Liposuction: Results of a National Survey." Dermatologic Surgery 28, no.11 (2002): 971–978. Lowe, N. J. "On the Safety of Liposuction." Journal of Dermatologic Treatment 12, no.4 (2001): 189–190. Lipoplasty Society of North America. 444 East Algonquin Road, Arlington Heights, IL 60005. (708) 228-9273; (800) 848-1991, ext. 1126. http://www.lipoplasty.com/business/lsna/index.htm . Covenant Health. [cited March 21, 2003] http://www.covenanthealth.com/Features/Health/Cosm/COSM4355.cfm . Liposuction Surgery Network. [cited March 21, 2003] http://www.liposuction-surgery.org/ . University of Washington. [cited March 21, 2003] http://faculty.washington.edu/danberg/bergweb/page2.htm . U.S. Food and Drug Administration. [cited March 21, 2003] http://www.fda.gov/cdrh/liposuction/ . Many liposuction surgeries are performed by plastic surgeons or by dermatologists. Any licensed physician may legally perform liposuction. Liposuction may be performed in a private professional office, an outpatient center, or in a hospital. How many liposuction procedures has the surgeon performed?